WALTON COUNTY, Fla— A suspect has been identified in the vandalism of a veteran’s park in Freeport on January 21st. The 14-year-old suspect was located and interviewed following investigative leads involving a separate incident of criminal mischief. 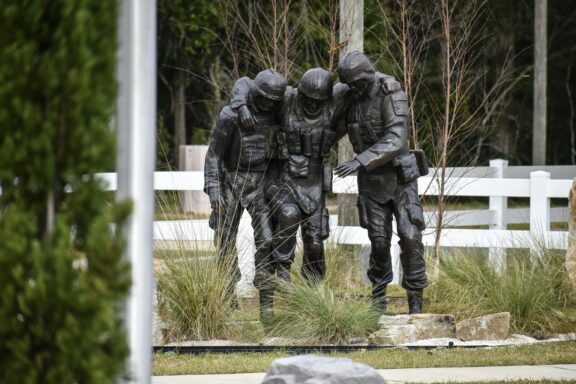 The juvenile admitted to defacing the statute of three service members where a bronze M16A2 rifle replica was ripped from the figure at Veterans of War Memorial at Freeport City Hall. On January 21st, a resident called Walton County Sheriff’s Office after finding the rifle replica in a wooded area on his property. Deputies later visited the park and observed the replica was forcibly removed from a statue located at the rear of the park. Charges are pending in this case. WCSO will update this release when charges are filed.